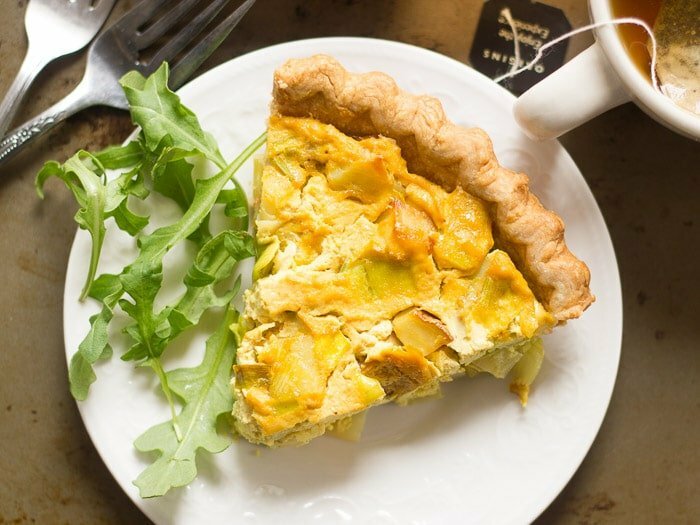 This vegan quiche is made with a savory mix of tofu, crispy potatoes and leeks, all baked up to tender perfection inside a flaky crust. It officially feels like spring, at least here in the northeast, and when spring arrives, the internet explodes with recipes for eggy things. I guess that means it’s brunch season (it is), and even though I’m a little bummed to see winter go (because I’m weird like that), I can certainly get behind brunch. I’m always a little jealous of bloggers and their eggy recipes, which is also weird of me, because I never liked eggs. But you’ve got to admit, there’s lots of cool stuff you can do with them. Fortunately, I’ve gotten pretty good with working around the egg part of most egg dishes. My husband, who was always a huge fan of eggs, is always super psyched about my vegan egg creations, and frequently requests quiche. It’s funny that I rarely make it though. 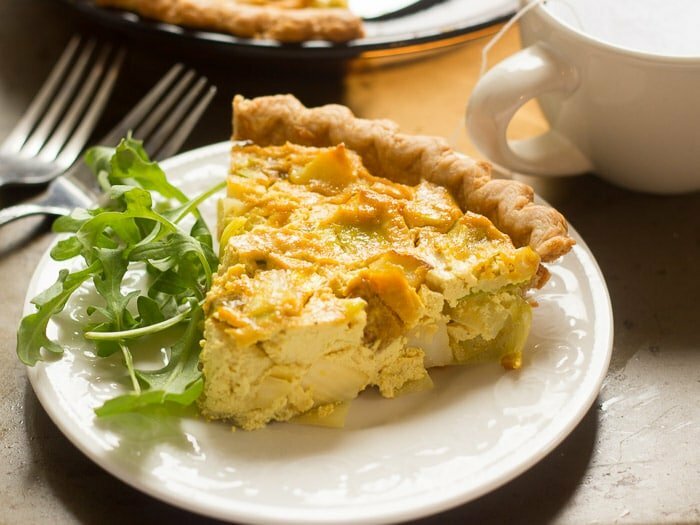 I think the issue with vegan quiche is that it seems super complicated and difficult, but it’s not! In fact, you only need one ingredient: tofu! 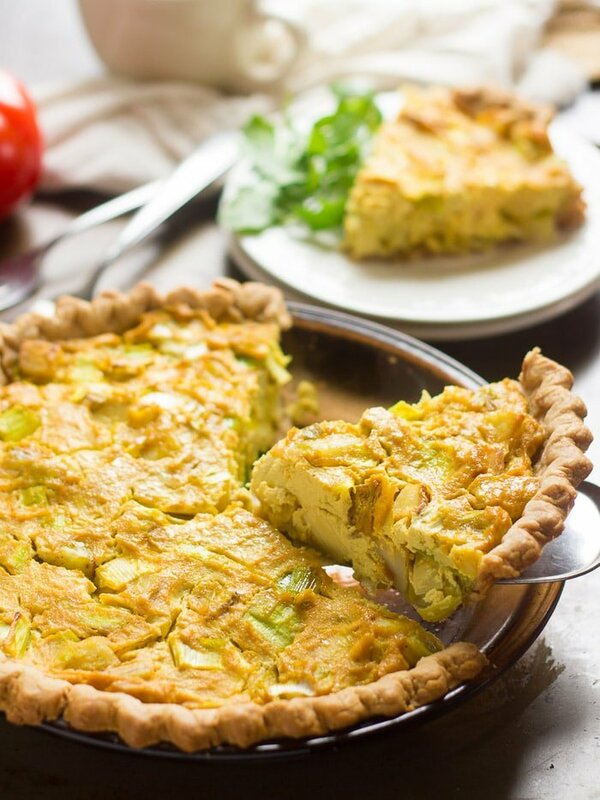 So with that knowledge in mind, and in anticipation of brunches to come, I went and made this vegan potato leek quiche. It was excellent! The potatoes do an awesome job of adding some hearty texture, and the leeks add the perfect amount of savory flavor. I ate my vegan quiche topped with hot sauce and ketchup, but my husband the egg expert tells me that’s weird. He eats his with just a sprinkle of kala namak for eggy flavor, which I choose to forego, because I don’t like eggy flavor. He tells me that with the kala namak it’s pretty darn convincing, so if you’re missing eggs this time of year, definitely get your hands on some and season it up. Place the tofu, nutritional yeast, soy sauce or tamari, lemon juice, and turmeric into the bowl of a food processor fitted with an S-blade. Blend until smooth, stopping to scrape down the sides of the bowl as needed. You can add splash or two of milk if absolutely needed to get the mixture smooth, but keep it to a minimum. Coat the bottom of a large skillet with oil and place it over medium heat. When the oil is hot, add the potato. Sprinkle with a bit of salt and pepper, and cook for about 10 minutes, flipping occasionally with a spatula, until it just begins to soften. Add the leeks and cook about 5 minutes more, until the leeks are soft, and the potatoes are fork tender and crispy on the outsides. Add the garlic and cook just until very fragrant, about 1 minute more. Transfer the mixture to the pie crust and smooth out the top with a spatula. Place the filled crust into the preheated oven and bake until the center is set, and the crust is browned around the edges, about 30 to 35 minutes. Allow to sit for a few minutes before cutting. Serve with a sprinkle of kala namak, if desired. This was AMAZING!!!! I just made this for Easter brunch and everyone loved it!! I’m the only vegan in my family and NO ONE could tell that it didn’t have eggs!!! Thank you for a fantastically delicious (and easy!!) quiche!! Will be making this again and again!! I’m so happy to hear that! Thanks so much for stopping back to let me know! Alyssa I want this to work. Tofu 1.14 ounces? It seems those who made this had no issues but me. Hi Dina! It’s 14 ounces. I just added parenthesis to the amount – hopefully that helps clarify! This was so good, Alissa, that my boy gave it eight out of eight stars on a four-point scale. Thank you for yet another great recipe! Thanks for this recipe, it was delicious!!! You’re welcome! Glad you think so! 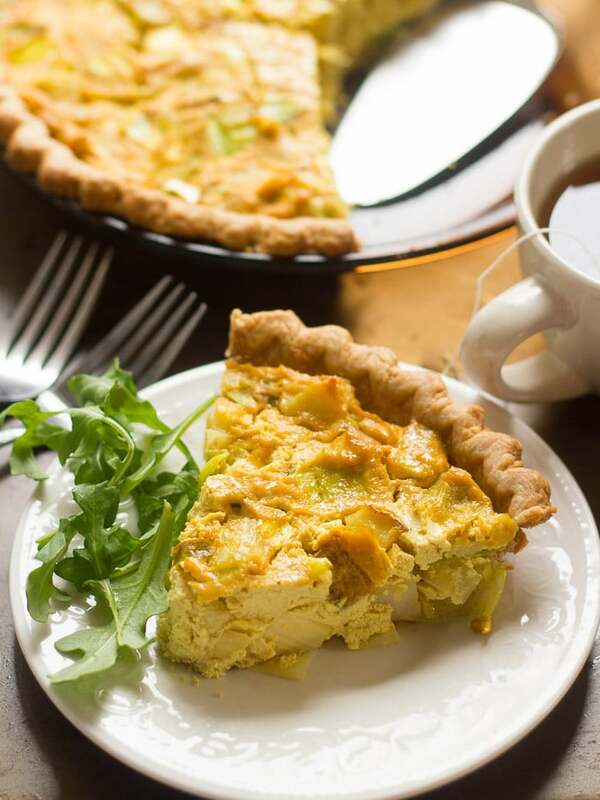 this is the absolute best vegan quiche i’ve ever made (and I’ve been making ’em for almost a decade). thank you so much! Yay! I’m so glad to hear that! Thanks Christine! I am not normally a tofu lover but I LOVE this! Delicious! Will try baking the pastry shell first next time or make it without pastry. My pastry was a bit soft. A RECIPE TO KEEP. Yay! I’m so glad to hear that! Thanks for sharing Rosemary! Hi there, this was tasty but a bit dry. Any suggestions on how to make it more moist? Add a little oil or more almond milk? Thanks for this lovely recipe! We tried it tonight and loved the combo. I will decrease the tamari next time as I found if overpowering and I want to taste the veggies more. Might try broccoli next time too! I hope your guests enjoy this! I used Bob’s Red Mill GF pie mix. The recipe says to make with half shortening & butter. I’m vegan so used only Earth Balance vegan butter and the crust was tasty & crisp. Also made 24 mini quiches with half batch of pie crust (froze the rest). Had some leftover filling and enough pie crust to make a little 6” pie too. Loved this recipe! Thanks for the recommendation – I’m pretty lost when it comes to gluten-free crusts and I know other readers will appreciate the info. Glad you enjoyed it!! Thanks Julie! I am always impressed that you absolutely make the best recipes. This one is no exception. I have never beeen disappointed in any of your recipes, thank you for sharing. Oh wow! I LOVE the potato crust idea! I’m definitely trying that next time I make this! And I’m so glad you and your boyfriend enjoyed this! Thanks Marry! Forgive my ignorance (as I’m new to a plant based diet)– does drained mean to press the tofu? It appears the tofu should have some moisture when processing. Thanks in advance…i can’t wait to make this! Drained just means not to include the water that the tofu is packed in in the recipe. No need to press it. :) I hope you enjoy this! Hi! I have your quiche in the oven, right now! I was wondering if you have any tips on how to make this ahead of time to serve. I was hoping to take it for breakfast, this weekend, at my inlaws. Should I freeze it unbaked? Or should I make it the day before and just refrigerate until time to bake? Thank you! I think it would be best to make it a day ahead and refrigerate it because freezing tofu changes he texture. I hope you enjoy it!! Yes, you definitely can throw in all kinds of veggies!! I’m so glad you enjoyed it! I absolutely love this recipe!!! 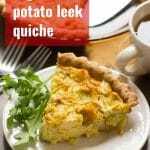 I’m not vegan, but I have an egg allergy and had really missed eating quiche. I’ve made it a hundred different ways depending on what veggies I have on hand, but I’ve always stuck to the recipe on the quiche base. Tonight, I’m making it with potatoes, kale, leek, artichoke hearts, and some red bell pepper. I highly recommend this recipe!! Also, it’s super easy to make it gluten free… just sub a GF pie crust (vegan if needed). Thanks so much for this fantastic recipe!! Just made this…and it was lovely. I fear there may be too much though. Has anyone had any luck freezing a couple of portions? Not sure if it will just turn watery. I have made this in the past and it is absolutely delicious. For Mother’s Day this year I made it again but switched it up. I followed the basic tofu formula but instead of potatoes and leeks, I threw in sauteed shiitake mushrooms and caramalized onions. My guests, who are not vegan, loved it and commented they would never have known it was vegan. I’m so glad you’ve been enjoying this! 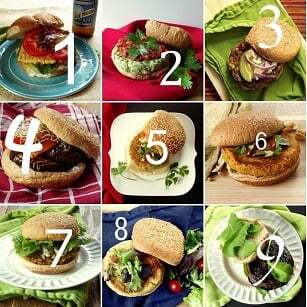 You can definitely switch it up by using all kinds of veggies. Shiitake mushrooms and caramelized onions sound delicious! This sounds delicious but not a fan of tofu . What would be a good replacement for the recipe? I’m afraid I’m not sure! 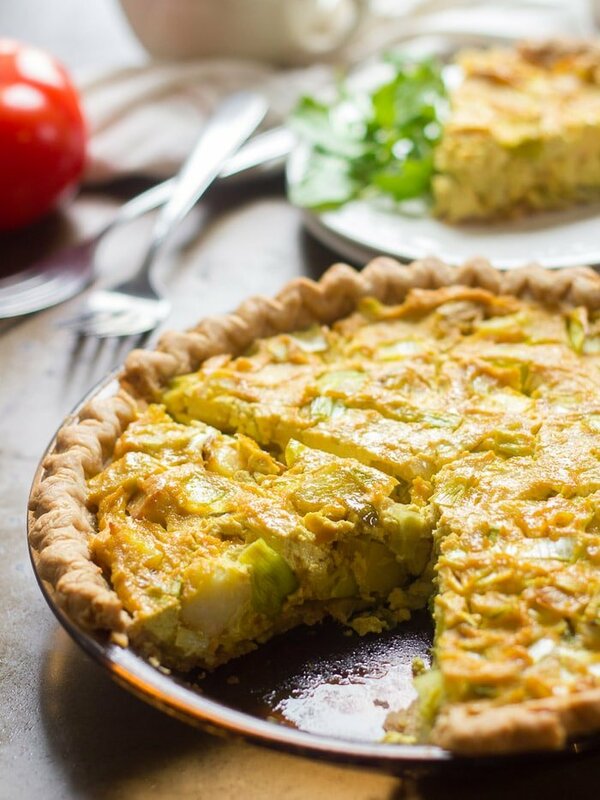 I’ve seen some cashew-based vegan quiche recipes, but never tried one myself so I’m not sure how it would work. Awesome!! I’m so glad to hear that! Thanks Tamar! wondering if this can be frozen ? I haven’t tried freezing it, but I think it would work! I have to tell you that this is one of my go-to recipes for any occasion. I’ve now made it many times, often for potlucks or when I want to impress a date or non-vegan guests. It’s always a huge hit and gets requested a lot! I even make it for oil-free people using pizza dough for the shell instead of pie crust. Last night I was making it for 12 people, so I trippled the filling and put it all inside a pizza dough shell in a large casserole dish. It turned out amazing as usual! Thank you so much for the recipe!!! Oh wow! I love the idea of using pizza dough – I’ll give that a try! I’m so glad you’re enjoying this! That’s awesome! I’m so glad it was a hit! Thanks Melissa! I tried subbing liquid aminos for the soy sauce. The smell of liquid aminos is overpowering. Does this happen with soy sauce too? Maybe once we taste it the flavors will balance. My own fault so if you say I messed up I will understand. Did anyone else try this switch? I’m not sure! I haven’t made this with liquid aminos, but I don’t find the smell of the soy sauce overpowering.